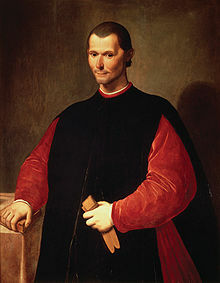 Niccolò Machiavelli (boen 3 May 1469 long Florence, daed 14 Septemba 1527 long Florence) em i bin wan blong Filosofi Itali. Emi bin raetem Il Principe (The Prince). This page was last edited on 26 Epril 2017, at 16:43.